Sponsored: Back to the wavy hair! We were both thinking if I still prefer straight hair, I will chopped off my hair the next visit. In this way I will get to try both hairstyles. HAHAHA! My hair is very dry and frizzy at the bottom so I did some trimming as well! And the perming began! The process was quicker than I thought. It lasted for around 30 minutes? I felt nothing much but just warm sensation. Pretty comfortable I would say cause I was freezing that time. Hehehe! Brandon also did a neutralize process which is very important because it help to neutralize the treatment that I have done before. It is also to balance the "hair bond" and to protect my hair from any breakage! Lastly, he did a Moroccanoil treatment to protect my hair from any environmental damage. I had done so many chemical treatments to my hair before so this is equally important as well! Are you ready for the outcome!? Did a little bit of touch up and start to selfie. By the way, the lighting in the salon is superb good. HAHAHA! Super duper love the tresses lah. I wondered why I couldn't achieve this kind of curl everyday! Hair before and after salon are soooo different! And you know what, Brandon just did it with a comb and hair dryer! Indeed magical hands! I have to repeat this again! 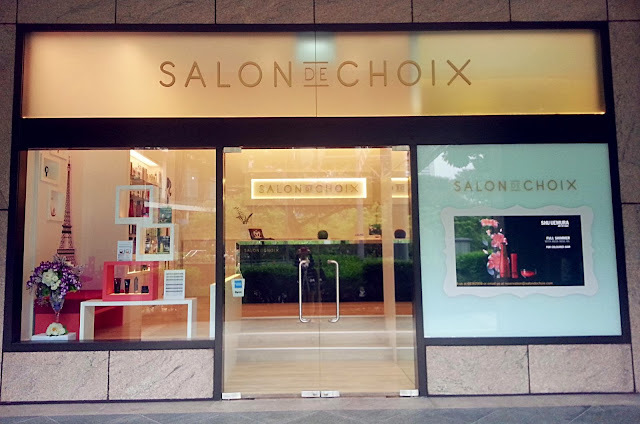 But for those who are interested and looking for a trusted hair salon, do visit Salon De Choix! Oh yah, don't forget to quote "Katty" to entitle 15% OFF! for all the treatments. Address: 3 Killiney Road #01-06 Winsland House 1 Singapore 23951 (Just few minutes walking distance from Somerset MRT). Do remember to call 6836 2959 to make your appointment!